We all agree this is the best looking, right? That looks great to me. Just clear anodize it so you still see the machine marks. It would have that awesome raw aluminum look. Check out these pics of the prototype Convoy L2 finish. It’s a clear anodizing with no sandblasting. It looks great. Clear anodizing “raw” look. Shows the excellent machining and maintains more of a bare aluminum look. Visually seeing the path/process and precision left behind look awesome! A piece of art. Remember in reality it looks much better than in the pictures. I think it took Simon almost a year to figure out how to get the finish in the pics I posted. His normal “clear” lights like the C8, L6 and S2+ are sandblasted and don’t look as nice. Maybe you could ask Mateminco if they can do less cutting on the light around the head in particular. The big slices on the head make it look pretty ugly. My guess is the light will use multi-emitters with TIR optics or small reflectors. 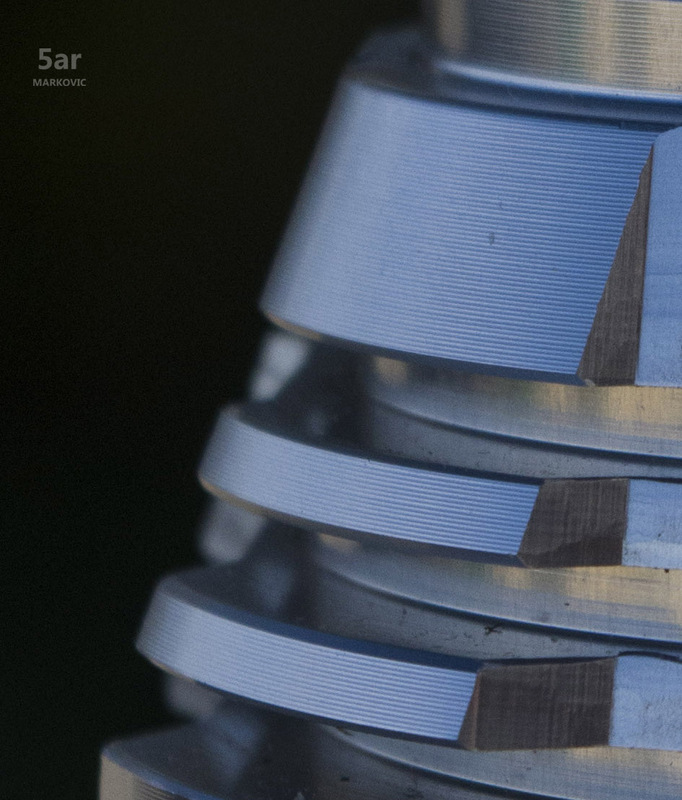 If it were a thrower with a giant reflector it would not be possible to have those super deep fins connected to a thinner stalk. I don’t believe that. Maybe you get 1 or 2 degrees cooler, but not something you would actually notice in the real world. Black or white are equally emissive. But polished shiny surface has really low emissivity. 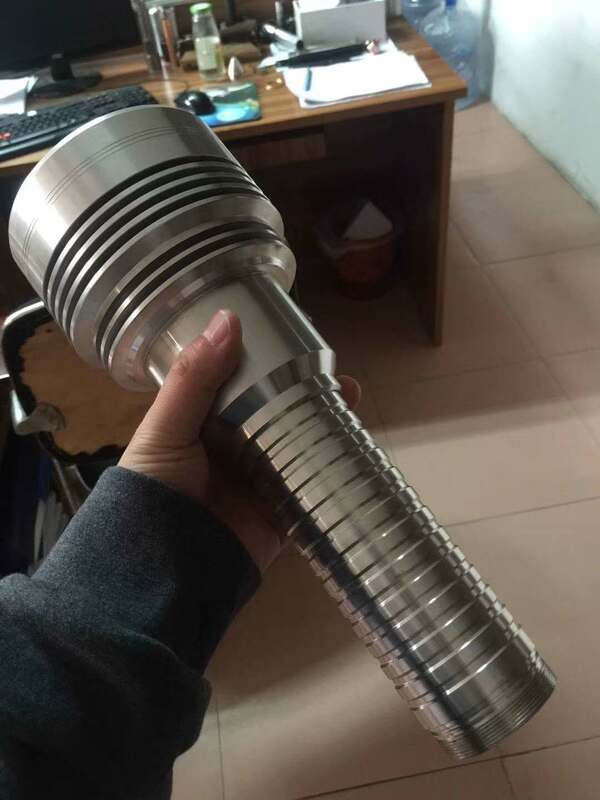 I think we should avoid clear ano of aluminum for high power flashlight as it can’t radiate heat to environment fast enough. Nothing is polished. Just fresh off the machine then clear coated. Black looks good, too. To each his own. I wish we could get some more info on this light. I think all color will be very close in emissivity. Just that the clear ano coat that maintain aluminum silver shiny surface will have very low emissivity. It will be great if a proper test done on them to confirm or end the disagreement. No, I don’t think it relates to lights this size. Personally I don’t let any of my lights ever get hot enough to step down. I almost always use them in short bursts. The only thing a black color might do for me is give it a few more seconds of run time on turbo which I don’t need. I’d rather have a bit more thermal mass to slow the heating up process. For other people, maybe they want slightly longer run times at lower levels? I guess if the brightness level is just right, the black finish might allow it to maintain steady output while the silver might not. That’s a rare situation, though. It’s not that big a deal to me. I don’t think they can do a silver finish anyway. It would just be a nice looking option that would attract me to it. INDEED! I’m losing sleep over this, gawd, to get more of run time in Turbo and all other levels will be Earth shattering, change life as we all know it! What is the superior heat shedding coating!!!! Ohhh the angst of it…. 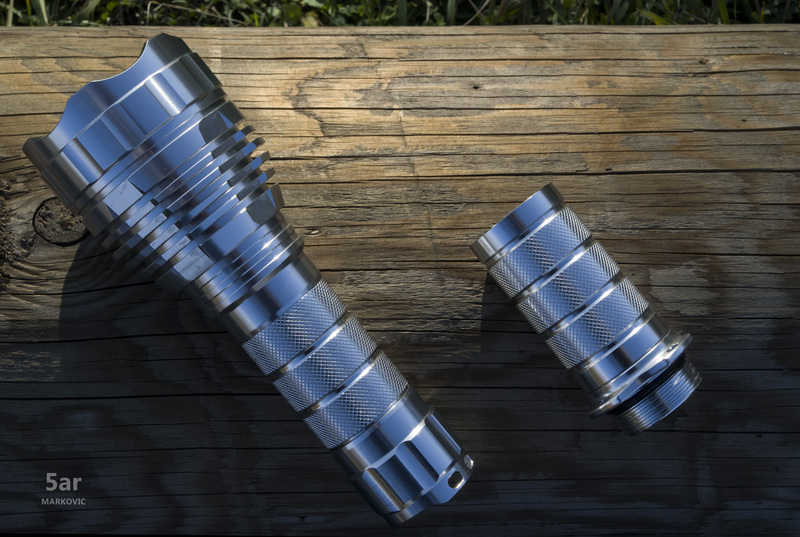 Anodization is what dramatically increases the heat emissivity of aluminium (because it increases the surface area). Bare aluminium is really bad on the other hand. The color is not important. There is no secret coating. Only increasing the surface area even more by using large heat fins with the correct spacing will have an additional large benefit. Check out aftermarket PC-component heatsinks to see how cheap, effective heatsinks are made. It can translate poorly over the internet. Plus there are many non English speakers here. I always make sure people know I’m exaggerating because people WILL take you serious. Well, i like to use Turbo mode for 10+ minutes with randomly switching to low/off for like 10s to reset. After that, it is getting very hot, i would grab another flashlight to play like this again. If a flashlight can only do 1-2 minutes turbo, i don’t think it is good to use it this way. Ya, i don’t know why Kawi got so excited over this. Looks like his sarcasm is exciting type. its been nice and quiet , thanks…. “ If people were more like Dogs the world would be a better place. There would be much less conflict and violence,instead there would be true harmony and grace. that is probably about the dumbest damn thing ive ever heard anyone say. you ever seen dogs get in a real fight ? dogs are harmony and grace ? lol ! You shouldn’t say mean things like that. You start to sound like him. Well, to me, people are mean occasionally. Most of the time people are nice. Dogs and people are the same. Just don’t take their kindness to be granted. Let’s focus on MF03 else M4X M4D will get really mad. just kidding. Any updates with this light production? 1. Does any one have any suggestion for fan-cooled system ? It might be the best solution for faster heat dissipation from the LED to the heatsink/ fins. 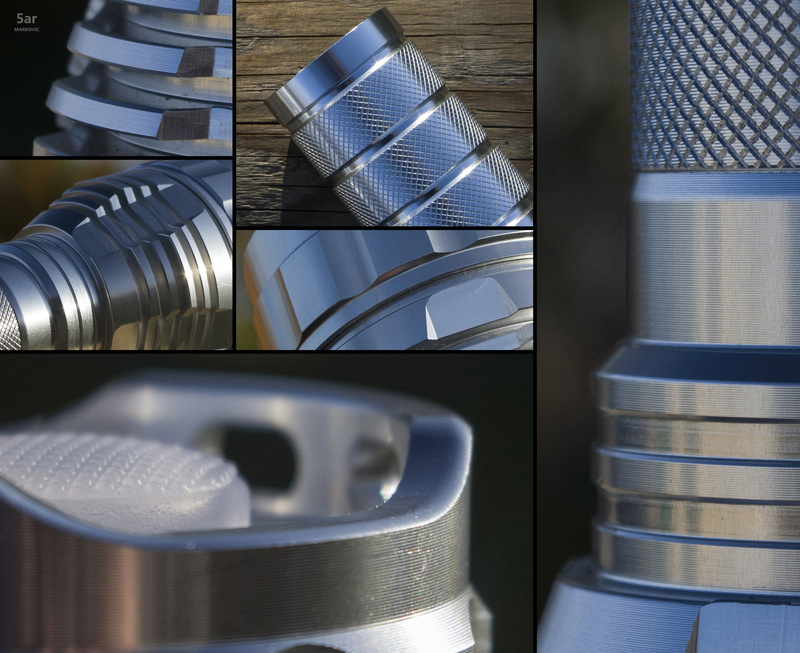 How is the mechanical construction / contact to the flashlight through the fins, yet water resistant ? 2. For the numbers of LED, any chances or possibility of having 10 pcs XHP-35 HD for the circular/ surrounding with thick & shallow OP reflectors, while using 1 pc XHP-35 Hi for the center throw with deep SMO reflector ? Can we assume 11*2500 lm = 27,500lm, 11*15w = 165w power consumption? 3. If the overall head diameter is 130mm, then can it be: a) center reflector diameter of 74mm (SMO), b) surrounding 10 LED with reflectors diameter of 25mm each ? 4. Can a diameter of 74mm SMO deep reflector project a 1600 meters distance ? Sorry for the lack of knowledge. I need to learn lots of things from the seniors. 1. Fan cooled requires a complete design starting from scratch. It won’t be this light. 2. Xhp35 are small and weak for the power they consume. You get much more bang for your buck with xhp70.2. Since the reflectors are shallow, the xhp35 has no advantage at all. It would also not be efficient to run xhp35 at 2,500 lumen. That is their max and they produce a lot of wasted heat. It would be 11 × 35w = 385w. If you use the xhp70.2 at 385 watts, you would get 44,000 lumen! I have to consider the source from someone as ignorant, unrealistic and uneducated as you! 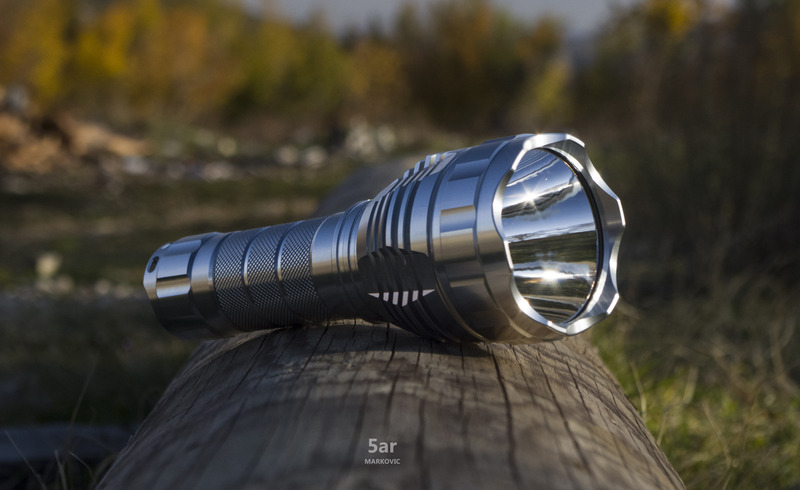 63k lumens. Let’s do it! I don’t care if the head melts and falls off within 5 seconds, in fact, I’d buy two if it did.